I admire people who are passionate. When you and I are passionate about something, we give it our all. We’re enthusiastic, bold, and persuasive. However, one area we don’t often associate with passion is prayer. Seminars or books on the principles of prayer may fail to help because the topic doesn’t awaken our excitement. 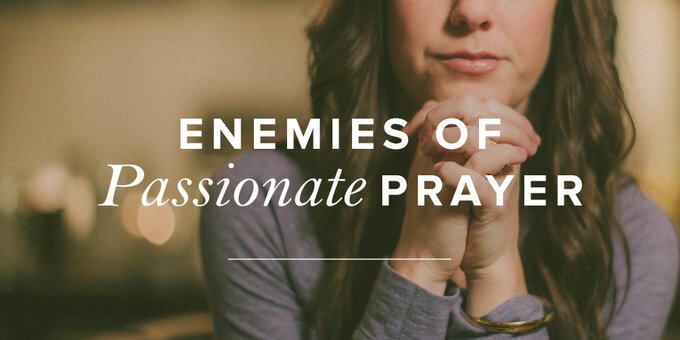 After years of struggling with “saying my prayers” while longing to be passionate about it, I finally began identifying the enemies of passionate prayer in my life. Prayer is often described as talking with God. However, it can be difficult to become passionate about conversing with someone we cannot see. Communication experts confirm our need to sense we’re being listened to when we speak. Moms tell children, “Look at me when I’m talking to you.” Wives appeal to husbands to put down the newspaper, television remote, or smartphone when having a conversation. My own prayer life suffered because I wondered if God really listened. Did I believe Him when He said, “The LORD hears when I call to him” (Ps. 4:3)? Belief and trust are rooted in relationship. God has shown Himself faithful and trustworthy throughout my relationship with Him. I had no reason not to believe Him, yet the times of waiting for answers to prayer took their toll. And those who never established a personal relationship with Jesus Christ will find it almost impossible to be passionate about talking with Him. There’s a huge difference between knowing about God and knowing Him personally through His Son. Attending church every week helps us know about God but does not guarantee we will be in a relationship with Him. Even those who do have a personal relationship with the Lord may feel discouraged in prayer because they’re not as close to Him as they would like to be. When I first came to know the Lord, I was told prayer would help me develop a closer relationship with Him. But I struggled in my prayer life because I didn’t feel close to Him. How could I get close to God if I didn’t pray? How could I pray if I didn’t feel close to God? For some Christians, prayer has been about the “have to.” Good Christians have to pray. God expects us to pray, other Christians expect it, and we expect it. One of the quickest ways to kill my passion for something is to tell me I have to do it. Prayer became a chore and a transaction: If I wanted God to answer my requests, He required me to spend time with Him. This led to another passion-killer in my prayer life—a focus on getting things from God. I spent my time and energy on what God could do for me—not just answers to requests for health, wealth, and happiness, but even requests for my own spiritual growth. I wanted to be more holy, to develop the character traits of “love, joy, peace, patience, kindness, goodness, faithfulness, gentleness, self-control” (Gal. 5:22–23). I wanted to be a good wife, a good witness, a good teacher, a good writer. Although these requests sound spiritual, they were all about me. Of course, God wants me to be a good wife or a good teacher, filled with the fruit of the Holy Spirit as I serve Him. But first, He wants me to just be . . . to be in His presence, to worship Him for who He is, and to seek His heart before I seek His hand. When we’re passionate about something, it shows. Ever listen to sports fans at a football game? Their passion is rarely expressed in constrained whispers. Yet for years I entered the throne room of God as if I were walking on eggshells. I convinced myself it was a sign of respect. Of course, our heavenly Father is worthy of reverence and awe as we approach Him. Yet few parents want their children to tiptoe around them for fear of what they might say or do. We want our children and grandchildren to respect us, yes, but also to love us unreservedly. We want them to know our love for them goes far beyond anything they could ever ask or imagine. Approaching God timidly might seem like a good thing, but His Word tells us otherwise. “Let us then with confidence draw near to the throne of grace” (Heb. 4:16), and “we have confidence to enter the holy places by the blood of Jesus” (Heb. 10:19). Knowing Jesus is interceding for us (Heb. 7:25) gives us confidence to approach our heavenly Father. If we enter the presence of God based on our relationship with Jesus Christ, then to come with anything less than confident boldness is to not take God at His word. The more I read God’s Word and grow in intimacy with Him, the more I’ve come to trust His sovereign will. The accompanying assurance that my heavenly Father does, indeed, know best, is a strong antidote for discouragement. Guilt has also been a passion-killer in my prayer life. Guilt over failing to spend enough time with the Lord. Guilt over failing to spend consistent time with Him. And guilt over breaking my promises to do better. So I stopped making elaborate promises to double and triple my quiet time. Instead of attempting radical overnight increases in my daily quiet time (and failing! ), I lengthened my quiet time in five-minute increments over a period of several weeks. Instead of trying to wake up two hours earlier the next morning, I set my alarm clock for fifteen minutes earlier, increasing it by an additional fifteen minutes each week until my quiet time developed into a protected time with my heavenly Father. Slow and steady changes resulted in successes that renewed my passion for the time I spend with the Lord. Pride is yet another passion-killer for me. For years, I avoided praying in public, not wanting to do it until I could do it “right.” Pride squelched my passion for prayer because I was concerned about how others perceived the way I prayed. God reminded me prayer is directed to an audience of One. The only person I’m speaking to is Him. But even with the Lord as my only listener, I still tried to pray as I had heard others pray. Consumed with getting it right, I wondered if I was using the proper words. Were they in the right order? Was my tone religious enough? I had a mental image of God looking down from heaven shaking His head in disappointment, ready to criticize me for not sounding holy enough. But God doesn’t listen to our prayers with an evaluation checklist. He isn’t armed with a rolled-up newspaper, ready to rap us on the nose if our prayers don’t sound religious enough. God is looking at our hearts’ passion as we speak to Him. Passionate prayer is a vital component of our relationship with the one, true, living God. Evangelist and teacher Oswald Chambers once described prayer as “getting into perfect communion with God.” Now that’s something we can all get passionate about! Ava Pennington is a writer, speaker, Bible teacher, and the author of Daily Reflections on the Names of God: A Devotional. Ava has written for numerous magazines, including Focus on the Family’s Clubhouse and Christianity Today’s Today’s Christian Woman. She is also published in twenty-three Chicken Soup for the Soul books. Ava is a passionate speaker and engages audiences with relevant, enjoyable presentations. When not writing and speaking, Ava loves playing with her Boxer puppies, Duke and Daisy.